The Living Proof Program™ is a comprehensive health program designed to uncover and address the root cause of your health issues and restore you to optimum health. Through comprehensive lab testing, dietary modifications, lifestyle changes and, most importantly, education; you will achieve outstanding results. Our program offers a unique perspective by putting you in the driver’s seat. Our goal is to partner with you and provide you with all the tools that you need to restore your health. 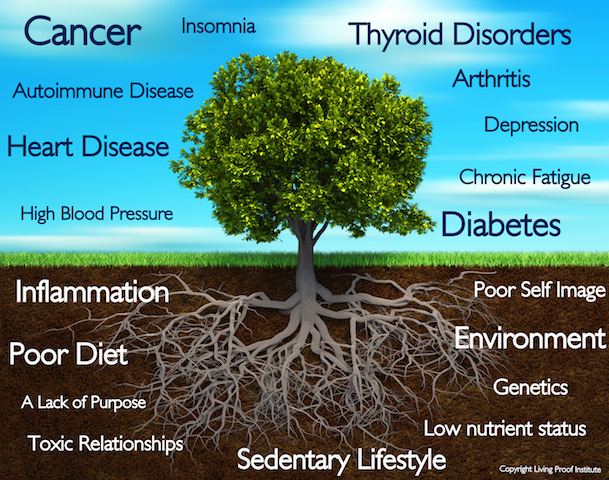 We will dig through the dirt to uncover what is contributing to your chronic health issues, not just mask the symptoms. It is absolutely critical to your outcomes that you uncover what is going on below the surface, since this is what leads to chronic health issues. The breadth of the program allows us to positively impact the major areas of your health including the nutritional, physical and biochemical. If you or a loved one is looking for a new approach to get to the bottom a chronic health issue, this is it. Let us customize a program that fits your needs. Learn how in the steps below. We are determined to get to the root cause of your health issues. Your story is the most important component to your case. By listening closely and investigating your medical history with more detail, we are able to recommend the most appropriate lab testing and lifestyle modifications. Your customized program will be developed by putting together your story, your lifestyle and your lab findings. You will receive an interactive health education as part of your program along with several opportunities to attend workshops and seminars. You will have access to our patient library of books and DVDs. Online education materials are also available and include audio recordings, video demonstrations, recipes and much more. Education is the driving force of your success in this program and we are committed to empowering you with it. Based on your initial assessment and lab fi ndings, a customized meal plan and nutrient solution will be created for you. This attention to detail allows us to ensure your are taking the right supplements and eating a balanced diet to address your nutritional needs. By creating sufficiency through diet you are ensured the best long term outcomes. Did you ever wish that you could speak directly with your doctor? Our goal is to provide exceptional service to you by providing you direct access to our sta ff. Get your answers quickly via phone, email or text. Better access equates to better results. By maximizing your health and vitality you are able to contribute once again. You are now an active member of your own life, and a contributing member to your family and community. Enjoy the bene fits of the Living Proof Program for the rest of your life.